Hello Friends! Have you had a chance to breathe since the holidays and your return to school? I have barely been able to keep my head above water, despite the hours of work I seem to do every day! I think it will be like this until June! 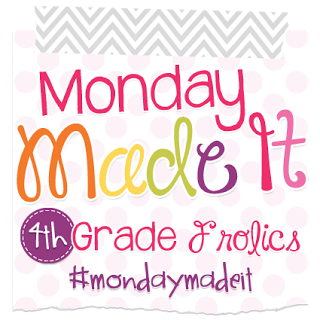 I'm lucky I finally found the time to link up with sweet Tara from 4th Grade Frolics for Monday Made It. I have been struggling with crayons, colored pencils, and markers for years. Each of my groups has a caddy to keep the group's supplies in. My students' desks aren't big enough for individual plastic containers (inevitably they crash to the ground), so I give them each a durable ZipLock bag or pencil pouch to keep their personal supplies in. Everything starts out great at the beginning of the year, then a few weeks in, chaos occurs! Crayons, colored pencils, and markers are all over the floor. 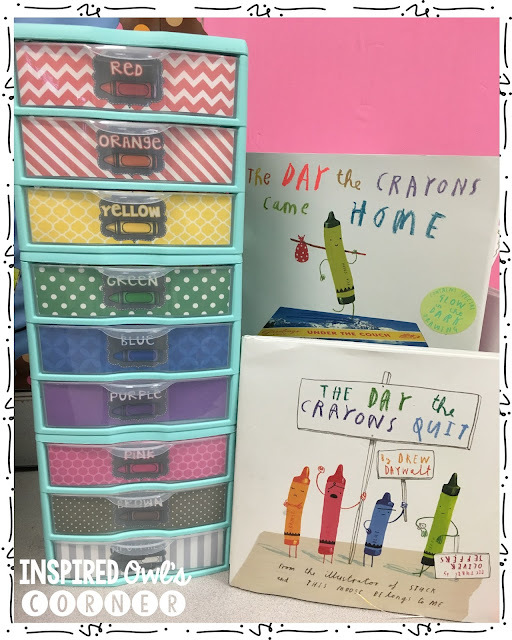 Crayon boxes break apart, so crayons become the biggest problem in my classroom. I'm pretty sure I saw this idea for organizing crayons on Instagram. I bought three of the smallest Sterilite three drawer containers from Target and stacked them. I made labels for organization and added some tape to secure them to the backsides of each drawer. I plan to have black, white, and grey in the same drawer, but you could add another set of drawers and add each color separately. I might work on my marker problem next, but I will need the larger sized drawers to organize those. If you would like the labels, you can find them here. I also made a set with white backgrounds to save your ink. I'm so excited to finally have a home for all of the homeless crayons all over my floor! Now I need help with colored pencils! I love the way they look, but sharpening them is a nightmare! I have gone through so many pencil sharpeners, even with the extended warranties I buy. I finally made a rule of no colored pencil sharpening in the X-acto sharpener! The handheld sharpeners only work for a short amount of time before they need to be cleaned out or break. Please tell me what works for you if you have found a solution to this problem! I think I need to create a colored pencil sharpener! By the way, have you read The Day the Crayons Quit and The Day the Crayons Came Home? We read them this past week, and the kids LOVED them! They are both so creatively written and entertaining. It's surprising that crayons could have such adorable personalities! These went along perfectly with our new home for the homeless crayons. Well, that's all I have for Monday (Saturday) Made It. Have a wonderful weekend! Goal Setting, Guiding Words, and a Giveaway!